What are Moon Rocks and How to Make and Use Them? Cannabis Caviar, Weed Caviar, Caviar Weed, whatever you call Moon Rocks, I must say this special trick is outside my personal experience. But, Moon Rocks is a rocketing trend with which I should catch up. 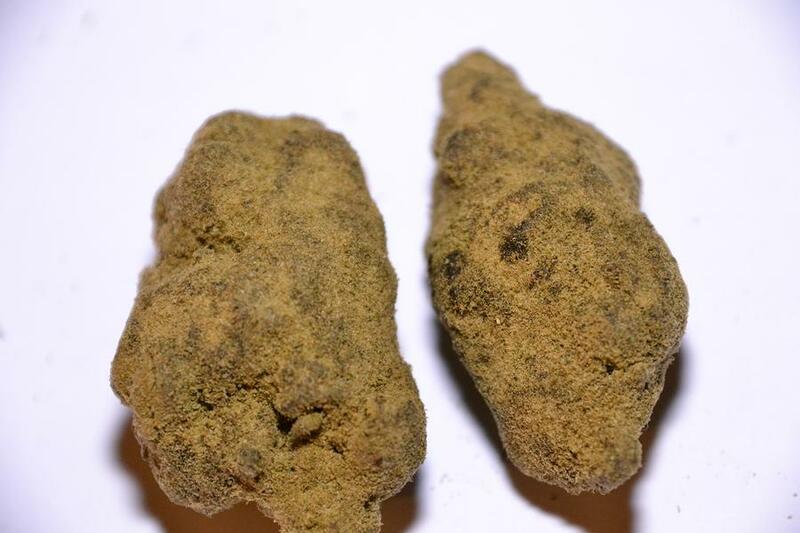 Your traditional Moon Rocks starts as a high-quality cannabis bud. You spray it with or dip in hash oil before rolling it in kief shake. It sort of looks like cannabis tempura. But, what it’s a nug covered with concentrate and THC-loaded. Now, depending on your components, you’re going to create a big experience! Between the nug, honey oil, and kief, you are looking at 50% THC, much higher than any single strain of cannabis. Now, you can moderate the effect by choosing your components, but the effect will be huge. Users discount the potency in favor of listing the effects. They point out you can start with a low THC strain and add high CBD elements to the mix. They argue you must consider the terpene and cannabinoid counts in the bud, oil, and kief. And, there’s that mysterious chemical interaction among these elements. So, with the right experience and interests, you can prepare your Moon Rocks for the rush or for specific medical purposes. Gently break off a compact piece of bud. Cover the bud with hash oil* using a brush or eyedropper but not soaking it. Use tweezers to drop the coated bud into the kief**. Rotate the oil-coated bud until evenly covered with kief. Let the bud dry thoroughly. You extract hash or honey oil from cannabis with butane or alcohol solvent. You want enough stickiness to hold the kief but not too thick to maneuver. You prepare kief by grinding dried resin glands (trichomes) of your favorite flowers. To prepare the Moon Rock for smoking, you cut it with a sharp knife or razor blade for use in a joint, bowl, or bubbler. Considering the ingredients in Moon Rocks, you don’t want to waste them. Herb warns, “Moon Rocks don’t burn as easily as regular buds, so it can be difficult (not to mention potentially wasteful) to consume them in joint form.” The texture is tough to light and keep lit. Experienced users prefer glass bongs or pipes. Grinding a rock would sacrifice hash oil and kief as would using your fingertips to process and move the Moon Rocks. One attraction to Moon Rocks is the extremely pleasant, terpene-rich taste, and aroma. But, who’s kidding? It’s the staggering head high that spreads throughout the body. After 30 minutes, you may find yourself someplace that’s over your head. You don’t do Moon Rocks in the morning or mid-day. You would do better to be on a couch or near your bed. Your side-effects will be accentuated, so you must stay hydrated with water before, during, and after using. You should not use Moon Rocks while you’re alone. You need an environment that includes people able to respond to or care for your needs. Moon Rocks are attributed to Death Row Records rapper Kurupt and his partner, Dr. Zodiak. Subsequent products have varied in quality and potency. The rocks offer a creative way to enjoy the different cannabis products at once. Pain Relief: The heavy THC assures a significant reduction in inflammation-related pain while using moon rocks. Loss of Appetite: Medical marijuana stimulates a non-existent appetite in those undergoing chemotherapy and radiation. Moon Rocks provides a fast-acting appetite stimulant. Anti-emetic: Small doses of Moon Rocks combined with CBD relieve patients suffering from severe nausea. Anti-anxiolytic: The THC content in Moon Rocks radically reduces anxiety even if it only situational or social. Anti-spasticity: Medical cannabis has significant seizure suppressing properties, and Moon Rocks escalate the impact in spasms. Understanding that Moon Rocks with 50% or more THC content will aggravate psychoactive and physiological responses, you should research and work at manipulating your content to find the remedy best suited to your medical problems. Some people see little difference among Moon Rocks, Molly, and Ecstasy. Preparing your rocks at home ensure you of what you have. Making your own will avoid adulterants, methamphetamines, and lab risks. It’s enough to get you to pass on an offer at a social circle. Given the THC content, you don’t need to add any risk.